The antioxidant benefits of tea for the body have been well-publicized. But tea is also good for the hair and skin, which is why it's showing up in a growing number of beauty products. I’ve done some digging and will take you behind the tea scene to understand what it is, what it does, and the differences between the various varieties. Tea is a generic word for an herbal infusion we herbalists also call a tisane. 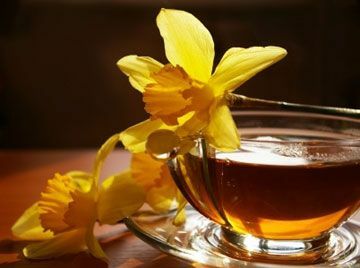 Herbal infusions are usually created from tender parts of herbs such as buds, flowers, shoots and leaves rather than tougher parts such as the root or bark. Tea is one of the oldest natural remedies known to man. Legend has it that a fresh leaf from Camellia sinensis fell into Chinese Emperor’s pot that was boiling water outside. He was intrigued by the smell, tasted it, enjoyed it and decided to make it a regular habit. The type of tea the emperor made by mistake is called “green tea” since it was made from fresh green leaves of Camellia sinensis. There are more than three thousand varieties of tea created from Camellia sinensis. In terms of camellia teas, green tea is one of the strongest healing medicines, followed by oolong and black. Green tea contains antioxidants believed to be two hundred times stronger than vitamin E. It protects the cells from carcinogens that can cause cancer. It also lowers cholesterol, metabolizes fat, reduces blood pressure, regulates blood sugar and has an antibacterial action. Green tea, and all tea for that matter, helps teeth and gums stay healthy by blocking plaque-forming bacteria. Green tea also contains fluoride. Black teas are fermented, creating numerous strong, dark-colored teas. In China, the semi-fermented teas are called oolong and black is fully fermented. Black assam, Ceylon and Darjeeling refer to regions in Southeast Asia and India. Black Tea can be used on hair in a number of ways. As we grow older, our hair gradually turns gray, losing its natural color. For some, this process begins as early as the 20s. Many women are not ready for such a big change and some want to hold onto their natural hair color. Like most dark fibers, brunette or black hair is more resistant to dyes than light fibers or blond hair. Tea rinses work with existing color, providing subtle highlights, increased shine and youthful vibrancy without permanent changes. (See below for a Black Tisane Hair Rinse recipe). All white teas contain higher catechins, gallic acid, theobromine and caffeine. They are the least fermented of Camellia sinensis teas and the highest in antioxidants. This antioxidant effect protects and strengthens both hair and skin. 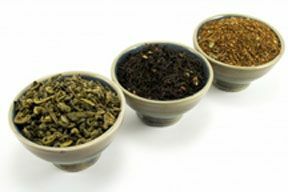 Polyphenols are very active in both green and white tea. These phenols capture and neutralize free radicals thought to pervert cells, causing cancer. In fact these two grades of tea are 20 times more potent than vitamin E in neutralizing free radicals, actually encouraging cancer cells to commit suicide and leaving your body in remission. 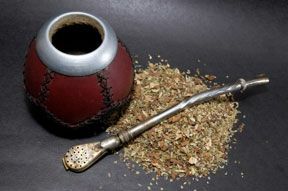 When seeking teas high in antioxidants to strengthen and condition the hair, look for hair products containing Rooibos. This tea also makes a fine rinse and will lend a definite red tone to brunette or dark blond hair. It is the perfect liquid to add to mehendi for temporary tattoos, henna paste, ready-made shampoo or conditioners to bring out hidden red highlights. This is an age-old formula for blending gray hair into darkly colored hair that I first learned of from the Gullah people. The Gullah, in case you are unfamiliar, reside in the Carolina and Georgia sea coast island areas and have kept much of their West African tribal culture intact through their folklore, medicine, food, arts and Creole language. This tisane works on the same principle of tea or coffee we don’t like for our teeth—staining; facilitated by the high concentration of tannic acids. Add cold water to kettle. Boil water; turn off heat. Pour some into clean tea cup and let it sit 3-5 minutes. Pour this water out into plugged kitchen sink for washing up dishes later. Add tea bags or infuser with herbs inside (usually about a single teaspoon to a cup of water) to cups. Pour very hot water from teakettle into cup until it is ¾ full. Steep at least 5 minutes longer for a stronger brew. Remove tea bag or infuser or strain. Drink as is or add what you prefer. Now that you’re warm from the inside let’s proceed. Boil water; add tea leaves. Cover; reduce heat to medium. Simmer 20 minutes. Reduce heat to low; simmer 20 minutes. Turn off heat; steep 1 hour. Strain. Apply using catch method. Catch method means pour the tea from a pitcher over your hair with a catch bowl ready underneath the bowl to catch excess liquid. You pour the tea back and forth slowly over your hair from bowl to pitcher and pitcher to bowl so that your hair is thoroughly saturated with the tea and capable of soaking in its subtle natural dyes. Do this 12-14 times. This black tea dye is a reliable color enhancer for brunettes providing good cover for graying hair of about 25% total gray. Stephanie Rose Bird is an artist and writer. She is the author of Sticks, Stones, Roots & Bones: Hoodoo, Mojo & Conjuring with Herbs and Four Seasons of Mojo: An Herbal Guide to Natural Living. She also hosts a Yahoo study and practice group based on her writing here.